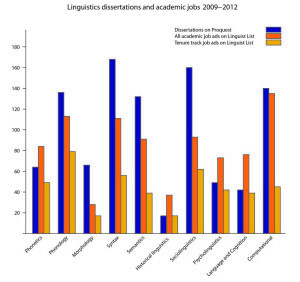 By no means does this graph reflect all of the jobs in linguistics. Linguistics actually encompasses quite a few related fields, including Speech Language Pathology (SLP) and foreign language teaching (including teaching English to speakers of other languages, or TESOL). ESL and SLP jobs generally don’t get advertised on the LINGUIST List. Plenty of social media, translation, localization, text analytics, branding, or countless other jobs that linguists are particularly well-suited for don’t make LINGUIST List either. But pretty much all academic jobs and many industry jobs do make the list, so it’s a fairly good gauge. When I made this graph, I collapsed psycholinguistics and cognitive linguistics into one category. I also collapsed NLP and computational linguistics into one category. The numbers to the left are the raw numbers of jobs tagged with each category. There might be a few jobs tagged as two subfields. I didn’t worry too much about that, I was just looking for a rough estimate of what subfields of linguistics are hot. The first thing you should notice is that the number of jobs increased every year from 2010 to 2013. Whether this is because more people found out how awesome it is to advertise on LINGUIST list or whether it’s because there really were more jobs, I don’t know. Probably both. Applied linguistics (which can include ESL and other language pedagogy research) was actually the hottest job category in 2013, and was in the top 5 in 2010-2012. Computational linguistics had the top spot in 2010-2012, and the number 2 spot in 2013. Sociolinguistics was near the bottom in 2010 and 2013 and didn’t make the top 10 in 2011 and 2012. 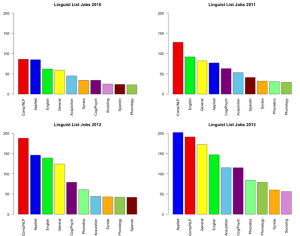 This is pretty much what Language Log found too: lots of jobs in computational linguistics, not so many in sociolinguistics. But they took their analysis a step further! Assuming most people who just got a PhD are aiming for an academic job, there’s going to be more competition (and more unemployment) where the number of jobs is fewer than the number of fresh PhDs. This is the case for sociolinguistics, phonology, morphology, syntax, and semantics. However, in historical linguistics, phonetics, psycholinguistics, and language and cognition there are more jobs than there are fresh PhDs! 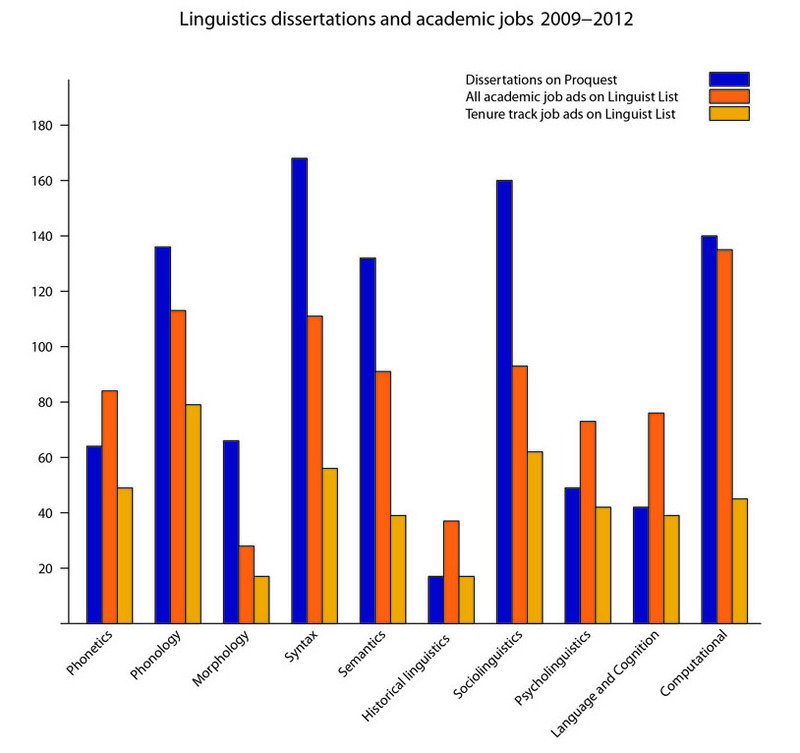 There also looks to be about equal numbers of academic jobs and PhDs in computational linguistics, but computational linguists also go the industry route quite often. So what’s this mean? Well, if you’re going to spend seven to ten years on a PhD (seriously) and you haven’t started yet, I really can’t tell you because I think the job market will probably be different in a decade. But right now it looks like there isn’t an even amount of competition our there, and some subfields (the notably more STEM-like ones) are more in-demand than others. But with unemployment down all over, why bother with grad school?